Tuning in? 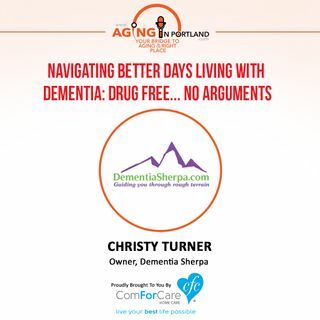 Christy Turner, the Dementia Sherpa, has been navigating the trails of dementia care and honing her craft for the last 17 years. She helps families figure out where their loved one is in the disease process, then creates an action plan to address both immediate concerns and those that are likely to show up in the future. Learn to communicate in a way that makes sense to people living with dementia, and also how to manage dementia-related behaviors without over-dependence on drugs.